I had been looking at doing Max's trio of 200k that break the Orr Springs 600k into more manageable chunks but my first obstacle (or excuse depending on how you look at it) was I could not find an affordable accommodation at the end of day one in Anchor Bay. All I found on a quick search was ~$200 per night places, a little more than what I want to pay for just a clean place to sleep. Max send me some other options that he had found but some were a few miles of the start and I just did not pursue the issue after that. 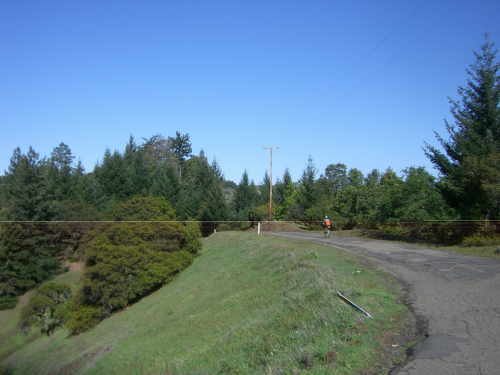 Megan A. sent an email proposing to ride most of the 600k route starting from her place in Santa Rosa. she gave it the appropiate moniker of PreORRdained Doing the ride like that would cut the San Francisco to Occidental and the Santa Rosa to San Francisco segments off of the route. She offered her place for riders interested to spend the night. That was it, I would be one of the monks! Just a small detail, I had no means to get there on the chosen date. After a few riders confirmed their attendance I asked if anyone could give me a ride and got offers from Larry S., Patrick H. and also from Metin U. Metin was going to drive there early on the morning of the ride so that worked perfect for me. On Saturday Morning he picked me up very early and we got to Santa Rosa around 5:30am. Megan, Deb B, Drew C and Patrick H, were having coffee at the table when we came in. A few minutes later Larry S and Carl A showed up. Nice turnout for a nice ride. Using Max's original ridewithgps map, I had created a GPS file that had only the parts we were going to ride and uploaded that to my GPS. Did not know what to expect in terms of group riding so I needed to have the route with me in case I end up riding alone. 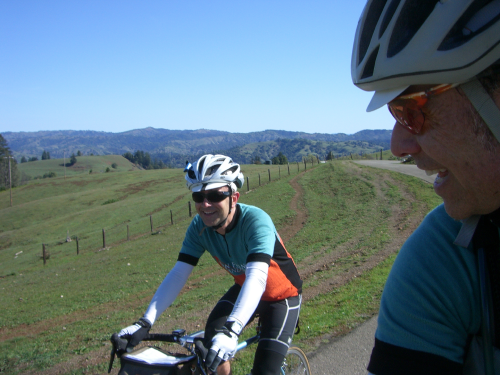 Turned out we rode together most of the time, except on the long hills but we always regrouped. So how was the ride? Well it all went very nicely and I did ride King Ridge for the first time. I had ridden Fish Rock last year (but going on the opposite direction) and will be riding it again in a few days with my Fleche team on the same direction as this day so it was nice to pre-ride that. After climbing from Gualala to Old Stage Rd I noticed a little play on my pedal stroke but did not think much of it and continued to Fish Rock. I was towards the back of the group and when it was time to climb on the steep gravel of Fish Rock the play became very noticeable. After a while I had to stop on the middle of the ~4 mile (steep) climb to check what the heck was going on. The play was not on the pedals but on the crankset. At first look I thought it was the crank arms coming loose and that was the one size of allen wrench I did not have with me! I continued climbing but now being very gentle on the drivetrain. Once I started descending, on the other side, I catch up with Drew who was getting ready to go after fixing a flat. I asked if he had an 8mm allen and he handed me the tool. Upon trying to tighten the crank arm I saw it was the Bottom Bracket (BB) that was causing the whole issue. That was not good news. Drew and I rode close for a while until he got a second flat and he told me to go ahead. When I got to where others were a few miles ahead, at the first place where pavement reappears, I told them my BB was done and also that Drew was fixing a second flat but I had not seen Deb or Larry in a while. After a short while I though it would be a good idea for me to move ahead of the group as my BB was slowing me down a little. They all agree and off I went. A few miles ahead on a flat section of gravel I had a pinch flat and by the time I was almost done the whole group went by. Pavement was just ahead so I figure i may be able to catch up with them. And I did. That was it for me, I knew I would not be able to do the rest of the ride unless I fix/replaced the BB. Fixing it was very unlikely as it was a Shimano UN73 sealed cartridge unit, once those things go, they go for good. 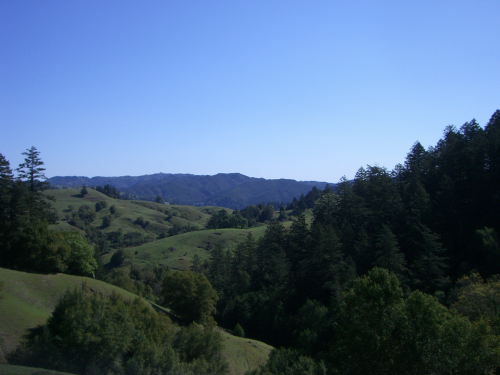 At Fish Rock @ Hwy 128 the consensus was that we would not have time to do the Orr Springs part of the ride and would just ride to Boonville for food and then cut across to Ukiah on Hwy 253 (Boonville Ukiah Rd) and spend the night there. My bike took me all the way to Ukiah where Metin and I shared a room at the Super 8 Ukiah Motel (707) 462-1514, just down the road from the Best Western motel where all others stayed. We paid $77 including tax and the two queen sized beds room was clean and included free breakfast (OJ, boiled eggs, toasts, waffles, bananas, coffee, yogurt and other typical stuff found on motel b/fast) There was free wi-fi, and the room had an AC, a tv, a small fridge and a coffee maker. Enough towels and soap. In general a nice clean place. The guy at the front desk was nice and if I ever need to spend a night in Ukiah that is the place I will go. Carlos-Rando-Approved & Recommended. A quick shower and then walked to the Ukiah brewing Co. Metin had called and asked if we could bring our bikes in, they have a fenced patio. They say no. The patio was empty but I guess to get in there we would have had to roll the bikes through the place full of patrons. A band started playing as we got our food. Our pizza was so so and so was the beer (Orr Springs) Next time I'll probably look elsewhere for food/beer. We agreed to roll at 8am next morning. We meet the group at the Best Western a little before 8 and left right on time. All this was new roads to me. Old River Rd was super nice and there was barely any traffic. After ~16 miles we got to near Hopland. The group was going to continue the route as planned. I was not going to press my luck on a damaged BB riding more dirt and climbing, I had to cut my ride short. 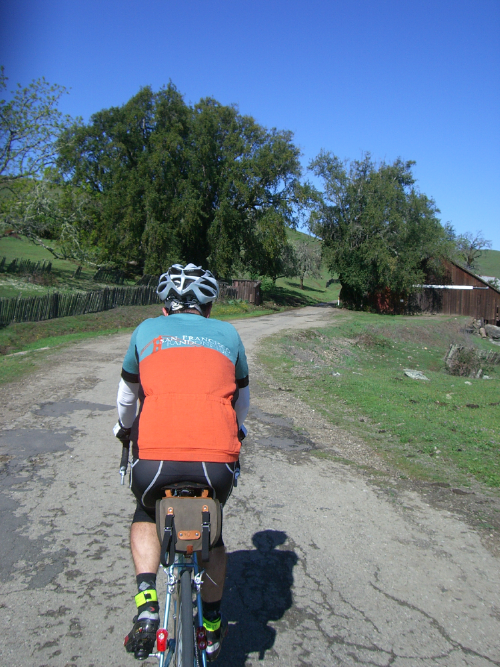 Just a few weeks before I had ridden the Hopland 400k and all this is familiar territory. Rode the same route as the 400k to Healdsburg at a very gentle pace and stoping in Geyserville for an It's-It ice cream sandwich thing that Megan had showed me the day before at one of our stops. Great ice cream sandwiches! 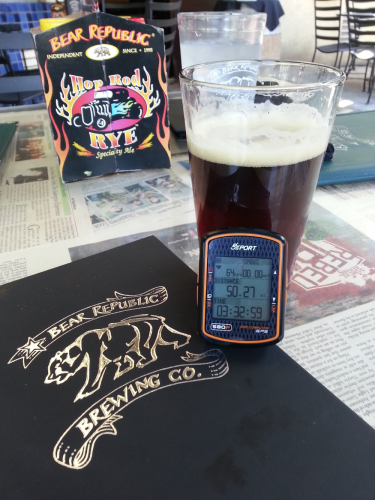 By 11:30am I was in Healdsburg being seated on the patio of the Bear Republic Brewing Co. My wife meet me there and then after we had lunch and walked around town a little, I hitched a ride home in comfort. I replaced my broken Bottom Bracket with an IRD QB-75. Here are my first impressions of it without having ridden with it yet. So what I think about the Orr Spring 600k parts I rode? IMO it will be very difficult for most riders to complete in under 40 hrs. There is no room for a mechanical or feeling not 100% on the day/s of the ride. It took our group ~3 hrs to complete the Fish Rock to hwy 128 segment. That included one regrouping. If you get a mechanical over there, be prepared to walk for miles before you get phone reception, so carry some extra clothes and food/water or just hope for no issues. Fish Rock gravel surface was in good shape but it had rain the week before. The previous time when I rode it, it was dusty and the washboards were more noticeable. Some on our group were using 25mm tires, I would not do the whole 600k on anything under 32mm. You may need to walk short sections but there is no need for knobbies, slicks are fine for what I saw of this ride. Remember the off road sections make just a small percentage of the whole distance. Are you gonna do the Orr Springs you ask? Don't know yet but if I am not feeling well the week before, I won't. 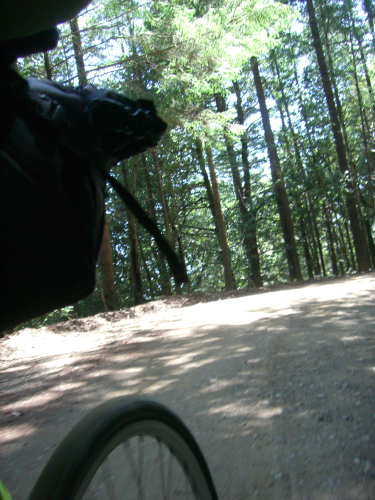 I am glad La Ruta Loca Randonnee 200k (LRLR) is two weeks before the Orr Springs 600k. For me, LRLR will be the best test possible before the longer 600k. If I can complete LRLR in ~12hrs I may have a chance at finishing the Orr Springs 600k in 40 hrs. However keep in mind we all have different strengths and weaknesses so that math may not apply to you. If you are new to mixed terrain ridding you'll need to do some catch up, this is not a good ride to try mixed terrain riding for the first time, but a good road rider who has survived a few hard(ish) mixed terrain rides may be fine. Climbing off road is a lot harder than on pavement and you'll need to get used to riding unfamiliar fire roads (gravel) at night. If you don't use a helmet light, you are missing on a very useful tool for riding fire roads at night. The headlamp let's you "see around" turns and fill in the gap where bike-mounted lights wont go. I hope the ride proves doable in 40 hrs by many but I am not to optimistic about that. I would love to be wrong on this but my gut tells me the route may need some changes to make it possible for the average mixed terrain rider to complete it in 40hrs or less. The challenge is not the mild technical skills needed for the off road segments, it is not a technical route, but the time spend climbing off or on the road. That will lower the average speed a lot for all riders. What about doing it on a fixed gear? I say you are in for a suffer-fest, your call. I do not want to discourage anybody from doing it. Just think riders should understand what they are getting into. My last though is, if you are contemplating the Orr Springs 600k you better start doing some serious mixed terrain riding with plenty of climbing and add night riding to the mix. Better yet, pre-ride parts of the route to know what you are getting into. Max offers almost the exact 600k route broken into three 200k Permanents that allow riders to preview to route on a more civilized way. It is a beautiful route and worth doing it.